Not offering McGriddles can be a deal breaker. The day we’ve been patiently waiting for has finally arrived: McDonald’s all-day breakfast is now available nationwide. After months of anticipation, McDonald’s has rolled out all-new breakfast menus so you can score a McMuffin with fries during your lunch break. Whether your local McDonald’s is pro-McMuffin or pro-biscuit, you can expect to find the nation divided as customers discover the differing all day breakfast menus. As we reported last month, depending on your location, the restaurant will feature a menu focused on either McMuffins or biscuits—not both. 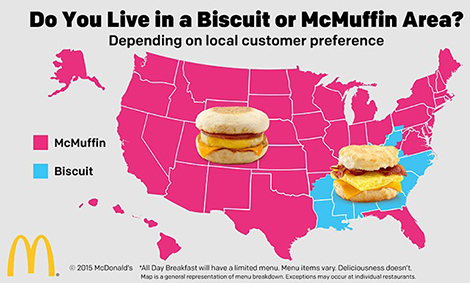 McDonald’s even created a handy little map to illustrate which states get to indulge in which breakfast menu. Customers are just now finding out that this “limited” menu has left out many of our breakfast favorites including the McGriddle and all-day hash browns. HEY @McDonalds WTF IS THE POINT OF ALL DAY BREAKFAST WITH NO MCGRIDDLES OR HASHBROWNS? NO ONE LIKES A TEASE. mcdonald’s all day breakfast menu doesn’t have hash browns or mcgriddles. aint no point tbh @mcdonalds. FYI there’s no all day breakfast at McDonald’s in Canada!!!!!!! Do you how many times I’d have killed for a sausage biscuit at 11? Now @McDonalds is having all day breakfast & I’m vegan. Sad cruel world.